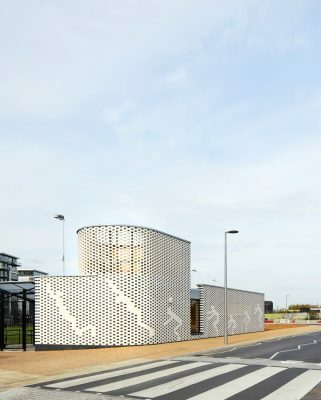 Penoyre & Prasad have completed the Bobby Moore Academy 2FE Primary School, part of the David Ross Education Trust, and its Multi-Use Games Area pavilion. Located in the heart of the Queen Elizabeth Olympic Park in Stratford, East London, the 2,250m2 school has been designed to maximise its relationship with the surrounding water and provide a striking addition to the park that will serve the growing local community. 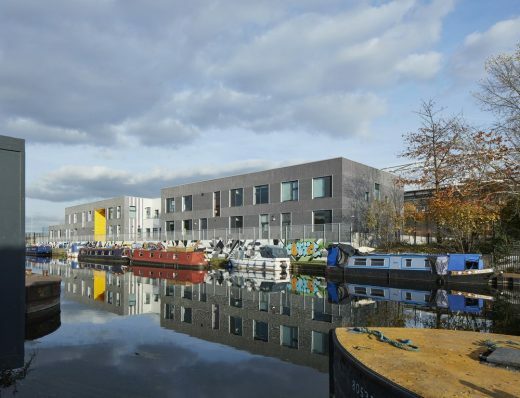 Stretching in a long, sleek two storey block, the design capitalises on its location alongside the Lee Navigation Canal. 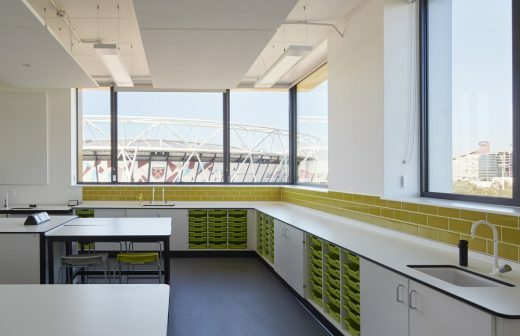 Large generous windows provide high levels of daylight in the classrooms, enhance the learning environment, and create a direct relationship between inside out, with views directly onto the water on one side and the Olympic Stadium to the other. This is further accentuated by the generous landscaping, playground, and entrance at the ‘forecourt’ of the school which welcomes students in. 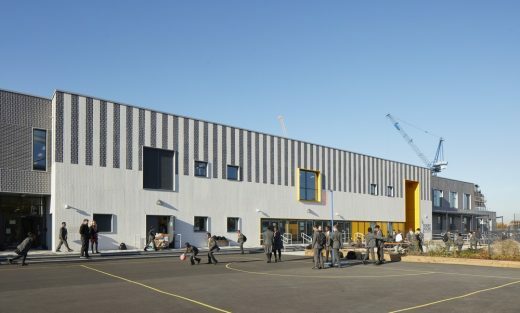 Divided into three contiguous parts, the primary school has been designed to enable upwards expansion to 3FE at a later stage. 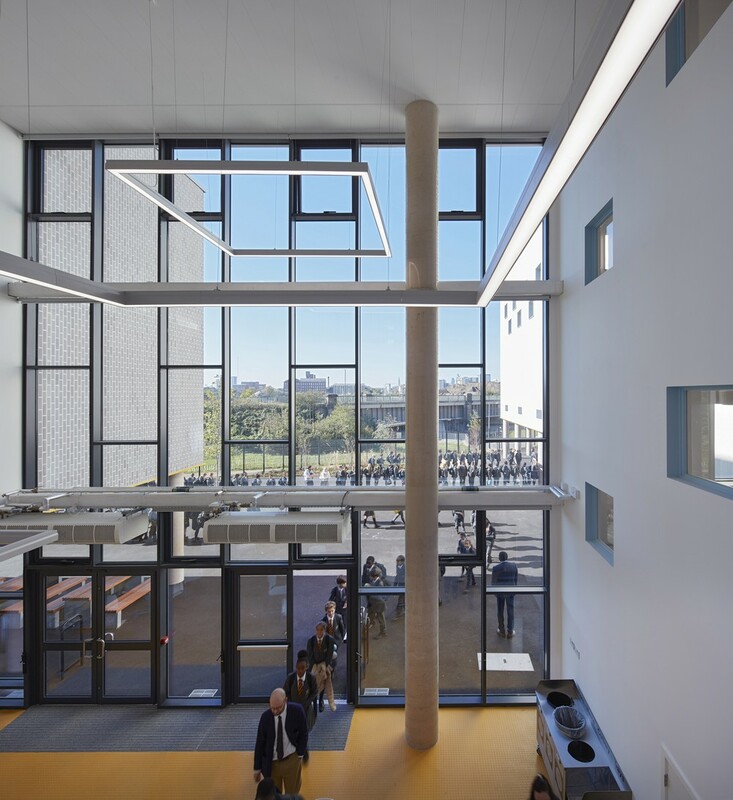 Key Stage 1 and Key Stage 2 teaching spaces are placed at either end and frame the central shared facilities of the main hall, dining, library and specialist teaching spaces. These are also accessible to the local community outside school hours. A terrace on the canal side provides additional teaching space, widening at the central hall to offer outdoor social and dining areas overlooking the water. 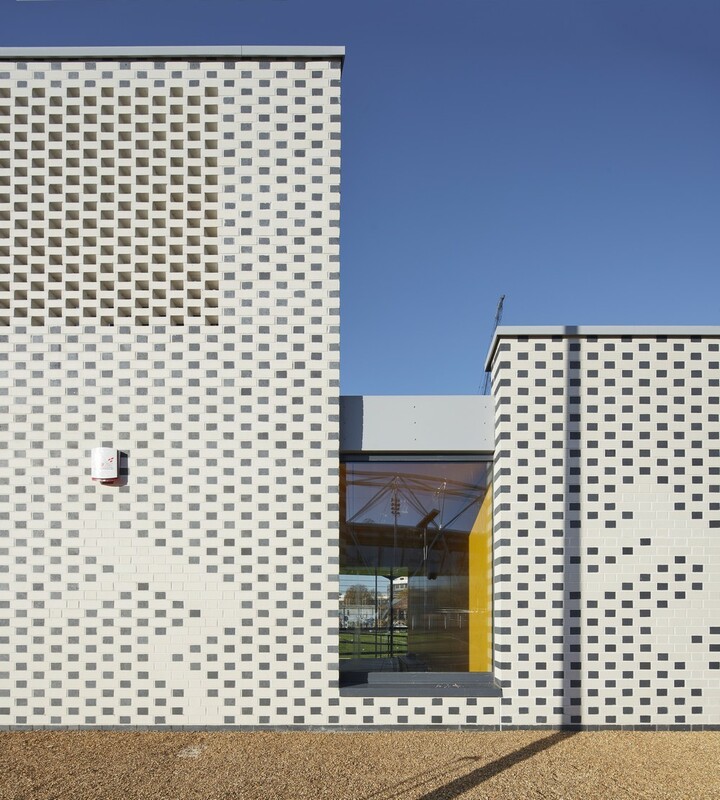 The architectural form of the primary school is simple and robust, using a muted palette of two-tone black and white brick tile cladding, playfully articulated with flashes of yellow trims to signify important spaces and entrances. Teaching spaces are naturally ventilated using hybrid thermal mixing units while large windows and double height spaces maximise daylighting throughout. The design has achieved BREEAM Excellent. 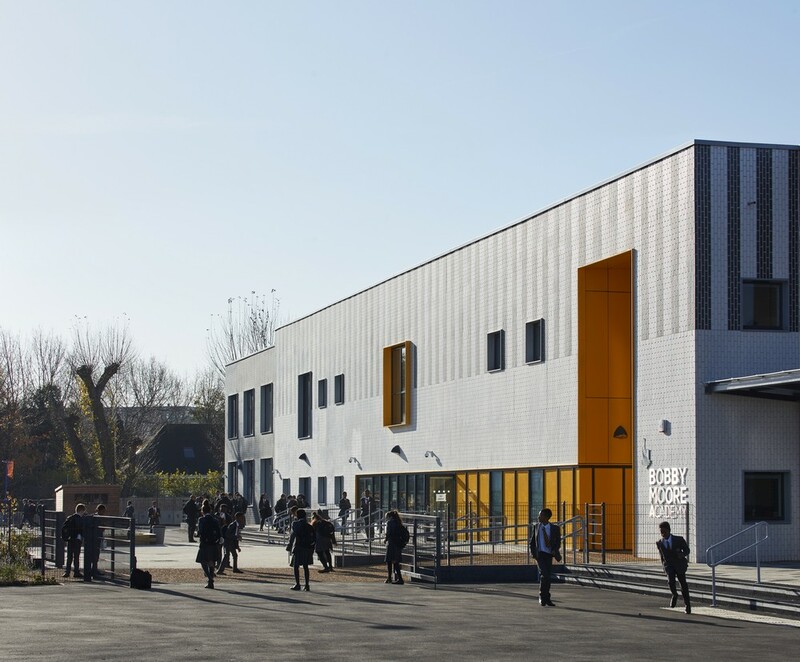 The school has been designed to accommodate future expansion upwards to cater for an additional class per year group. Adjacent to the Primary School is a Multi-Use Games Area and small pavilion for use both by the school and the local community. The pavilion contains changing rooms and storage and has been designed as a small beacon at the intersection of Marshgate Lane and a future bridge from Hackney Wick. A two-storey turret is formed by a basket weave of brickwork, screening high level plant, while the black and white brickwork, reflecting the colours and materials of the Primary School, is inscribed with figures that reference the photographs of the Victorian photographer Eadweard Muybridge. The Primary School and Multi-Use Games Area/Pavilion are the first phase of an all-through school for the David Ross Education Trust. The nearby secondary school is due to open September 2018. Bobby Moore Academy, Olympic Park, London – Penoyre & Prasad from Penoyre & Prasad on Vimeo. Penoyre & Prasad completes exemplar high-rise school in the heart of the Olympic Park. 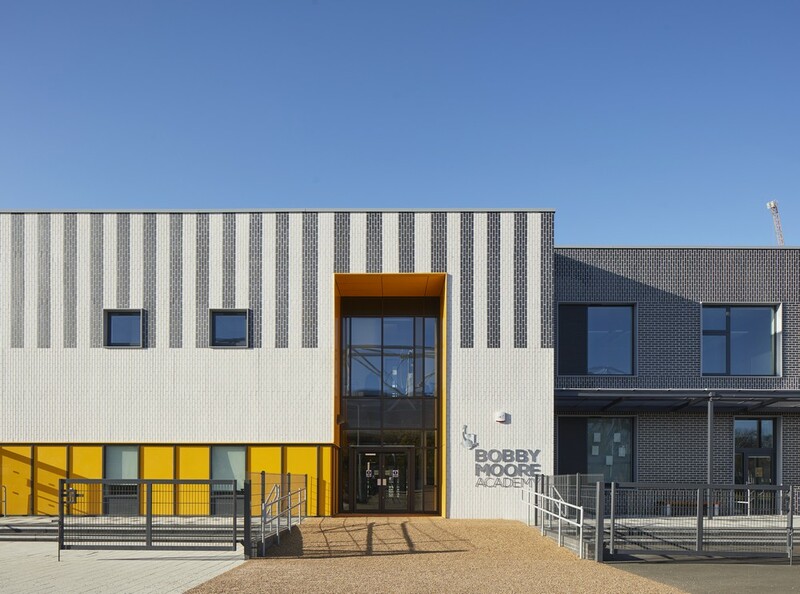 The Bobby Moore Academy, Secondary School, marks the completion of Penoyre & Prasad’s work for the David Ross Education Trust in the Queen Elizabeth Olympic Park. The Primary School, also designed by the practice, opened last year on the other side of the Olympic Stadium. 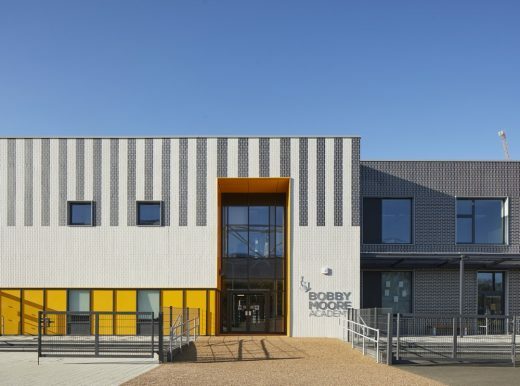 The Bobby Moore Academy Secondary School is a new 6FE secondary school for 1140 pupils on one of the smallest secondary school sites in London. 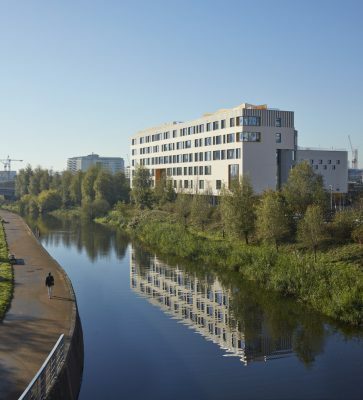 Situated in the heart of the Olympic Park, it provides much-needed education and community facilities to support the growing local neighbourhood. 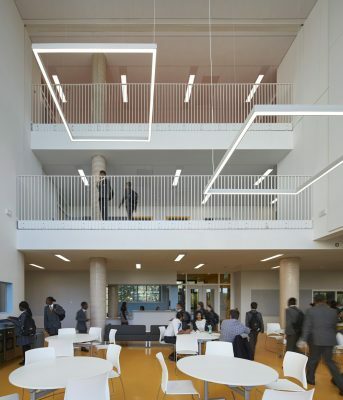 Penoyre & Prasad has created a new exemplar for the high-rise school, a design comprising 9,240m2 of diverse learning and social spaces across six stories, woven together through vertical and horizontal connections. 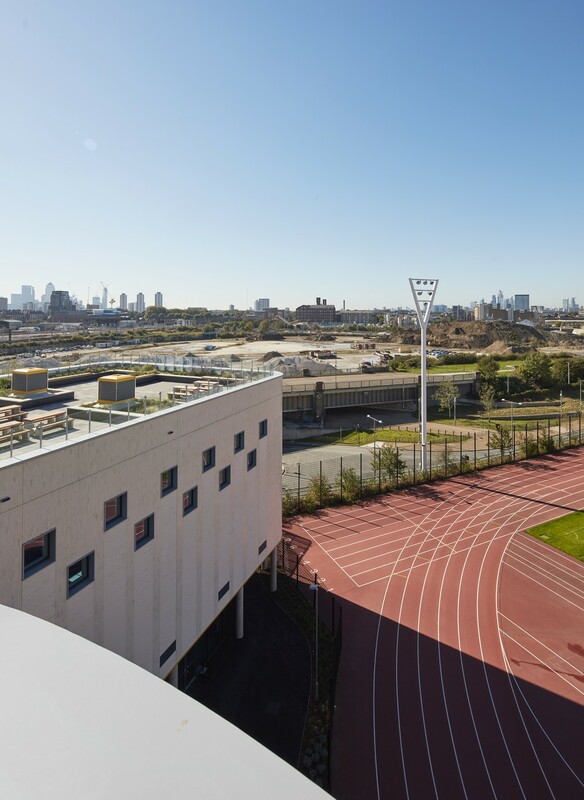 The building presents a strong architectural presence to hold its own against the dominant Olympic structures such as the Stadium, Orbit and Acquatics Centre. Its articulated form presents a bold civic presence to the Park, fronting a new public space overlooking the Mill City River. Architecturally, it has a kinship with its smaller sibling, the Bobby Moore Academy Primary School, opened last year and located west on the other side of the Olympic Park. 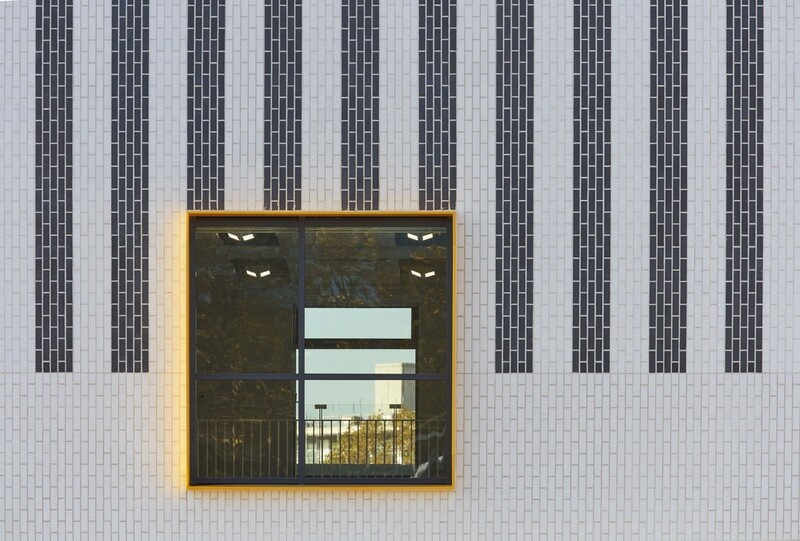 The crisply detailed palette of two-tone brick slips in a woven pattern of glazed and matt finishes, the deep aluminium window reveals punctuated with bright yellow accents, and the carefully articulated massing creates a distinctive identity for the schools. 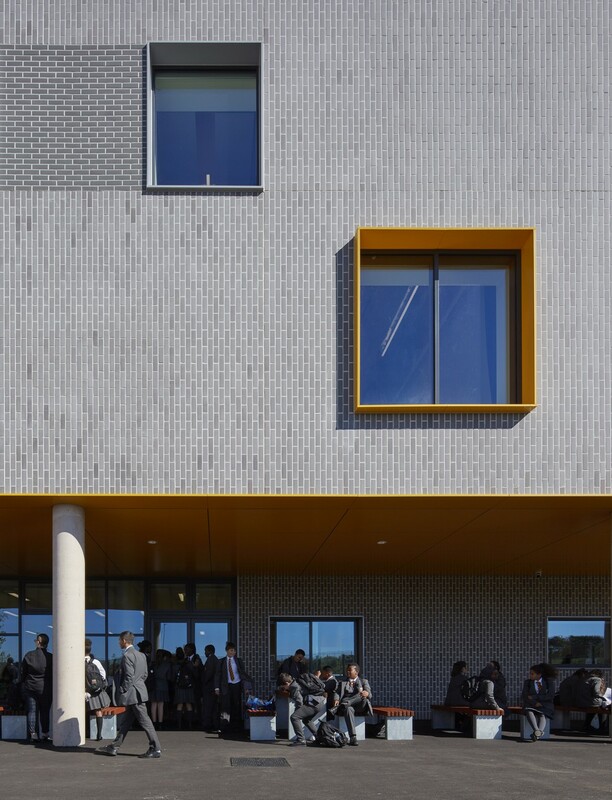 The secondary school is carefully positioned along the site’s northern boundary to maximise south-facing external play space. 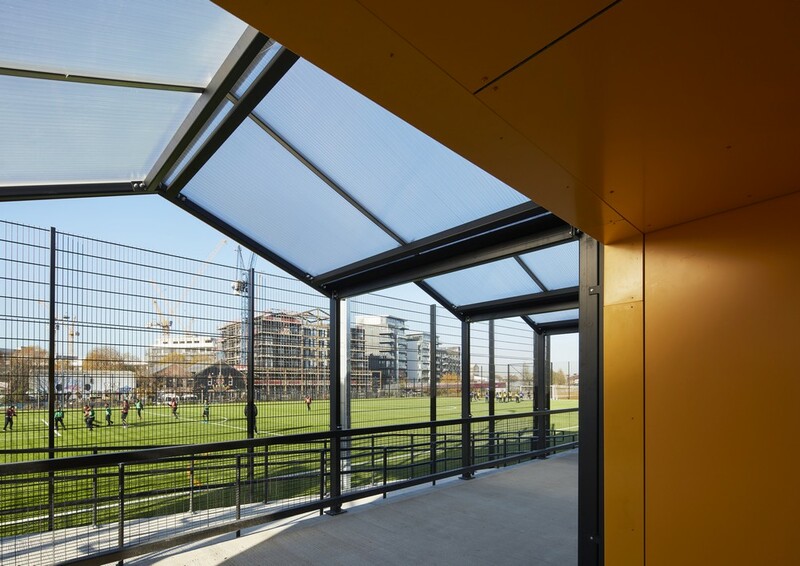 The main large spaces – assembly hall and sports hall – are raised to the first floor providing outdoor covered social space at ground level. A series of roof terraces step up the south elevation to provide additional external social space, commanding distant views over London and Canary Wharf. 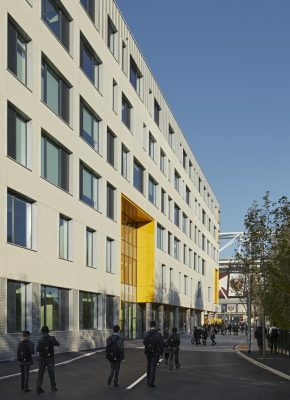 The building was designed in extensive consultation with the David Ross Education Trust and the London Legacy Development Corporation, with complex educational and community needs. It has been organised as a truly inclusive facility to be used in evenings, weekends and holidays by the wider public. Community-accessible facilities – dining, gathering, assembly hall, music and IT teaching, and sports facilities, are located at ground and first floor, with inclusive changing facilities at both levels, with the school’s teaching spaces on the upper levels. An extra large lift accommodates parasports teams using the sports hall. 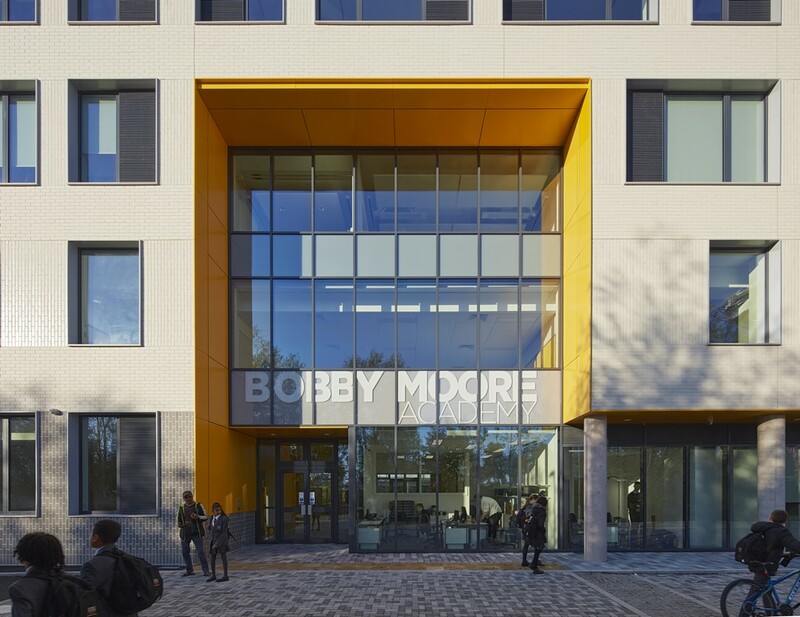 Packed into its compact form is a school of generous proportions, incorporating a web of large and small spaces, visually and physically connected through voids, screens and walkways. 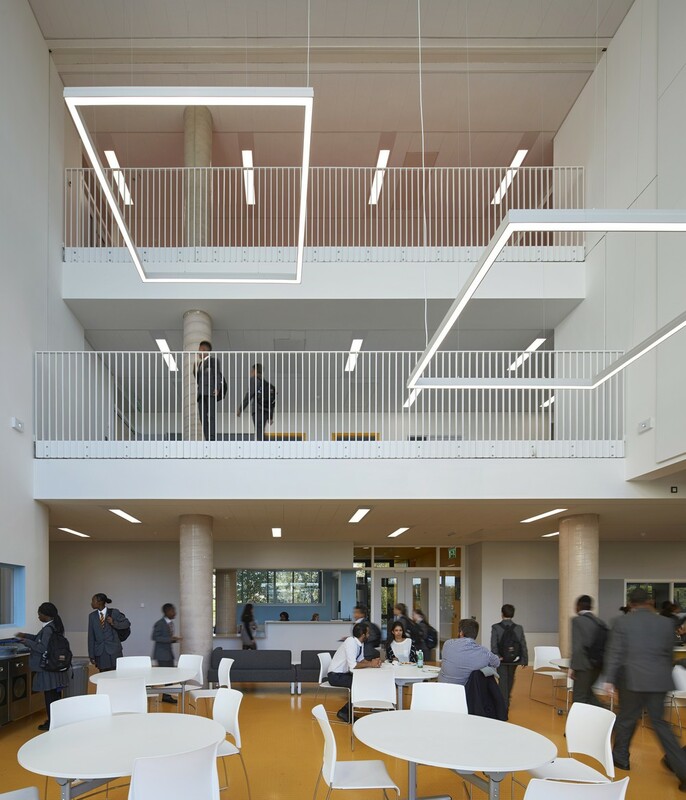 A central triple height atrium rises up the centre of the building forming the heart and focus of the school, and providing orientation along the corridor’s length. Above this sits a double height library, with a roof terrace above. A triple height sports hall and double height assembly hall and drama studio are inserted as distinctive volumes at first floor, while a double height dance studio bookends the building at one end. 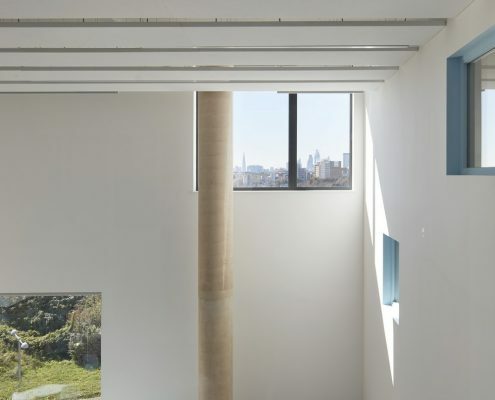 Windows and screens maximise transparency and views through and into these spaces. 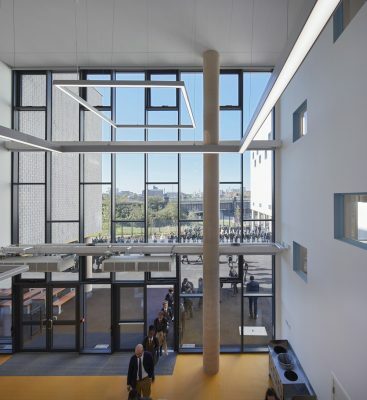 A generous internal ‘street’ forms the backbone of the school with voids punctuated on each level to connect the floors and provide light from skylights above. 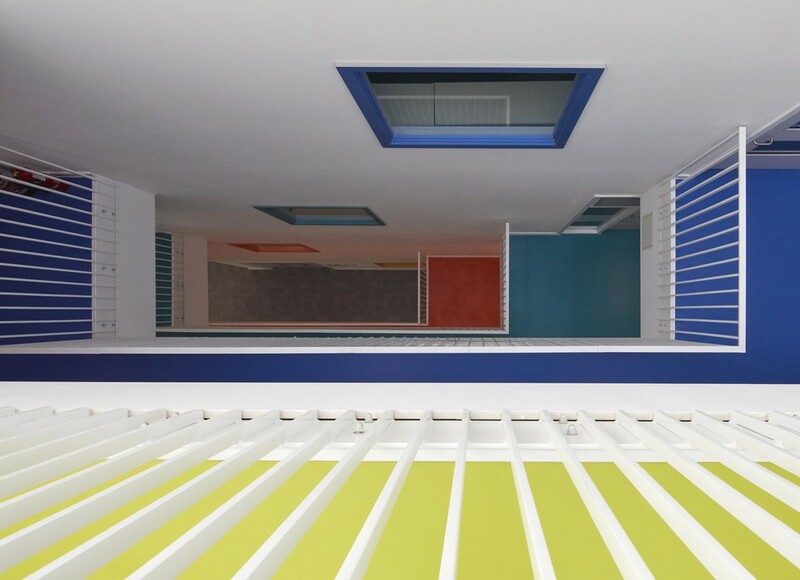 Coloured floors and signage provide identity and orientation. Arranged either side of this wide central spine are teaching spaces organised by faculty. Throughout the school, large windows maximise views to London to the south and the Olympic Park to the north while providing plenty of daylight and sense of openness to the teaching spaces. 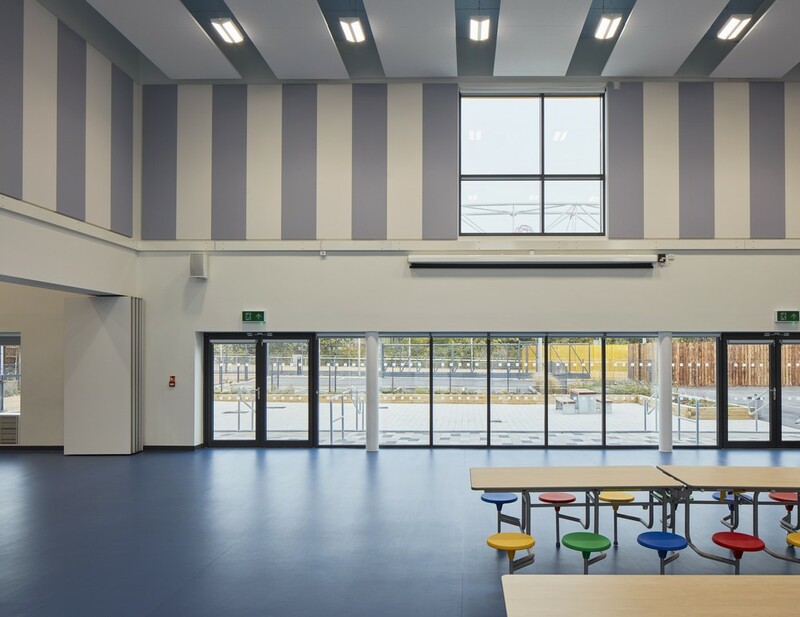 The majority of teaching spaces are naturally ventilated, utilising low energy heat recovery units fixed to the windows. The flat-slab insitu frame provides thermal mass while allowing long-term adaptability, and LED lights and low-flush toilets reduce energy and water use. The heating system is linked into the Olympic Park-wide district heating network. 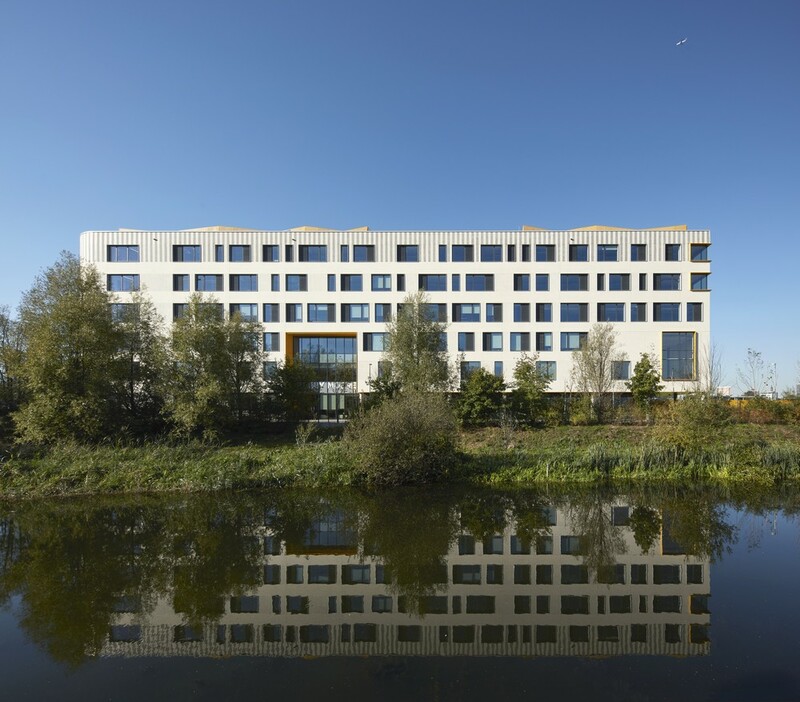 The school is on course to receive BREEAM excellent certification. 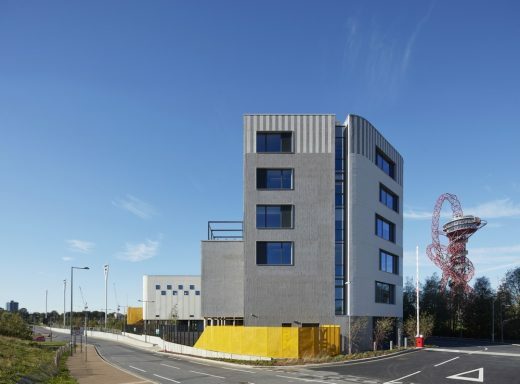 “The new school is a beacon of learning in the rapidly developing Olympic Park. It provides first-class educational spaces while capitalising on the world-class sports facilities around it. The big challenge for the design was accommodating the large programme of spaces on such a tiny triangular site of less than 3900m2 while maximising external play space for the students. Set in the pantheon of great Olympic architecture, it also had to punch above its architectural weight. Given the site’s exposure on all sides, the building is conceived as an object, seen in the round and from afar. 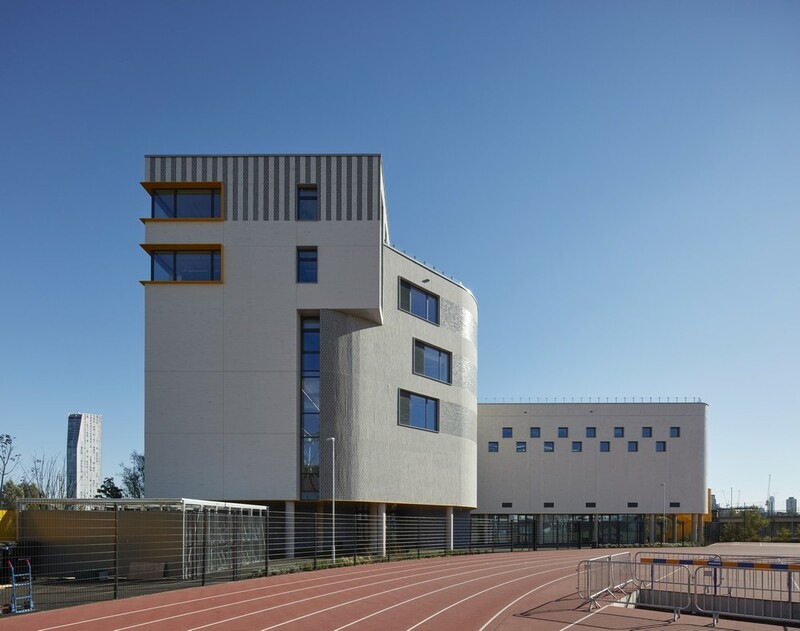 Its distinctive form and architectural expression serve to create a strong identity for the school while rooting it in context and creating a civic realm where none existed before. The building is like a tardis. From a distance, and in comparison to the Olympic Stadium and the vastness of the Park, it appears small and dimunitive. 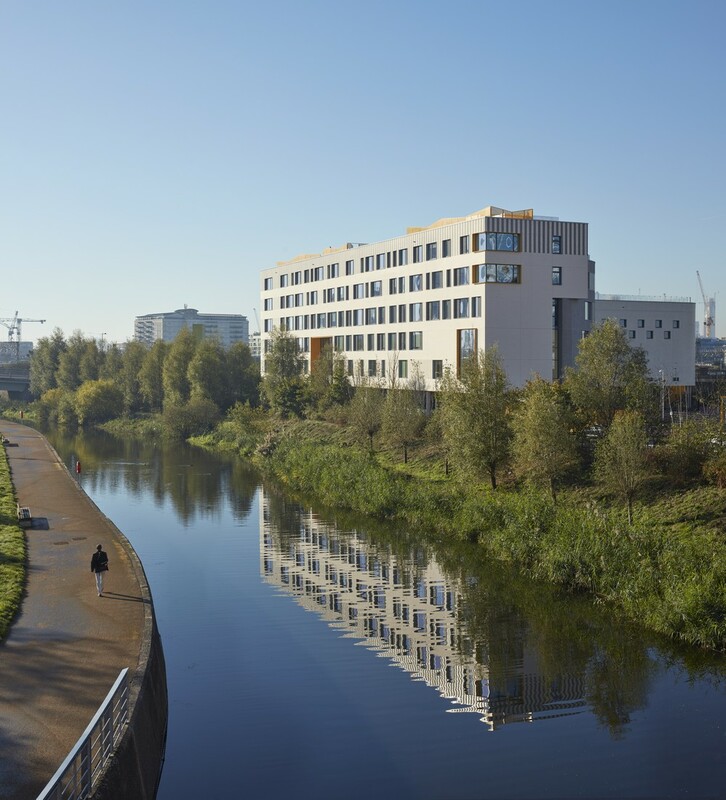 On closer inspection, it has a more dominant and civic presence, commanding its site and the adjacent canal. Penoyre & Prasad is a design-led practice, with over 30 years of experience across many sectors. A distinctive design approach results in functional, sustainable and award winning buildings. 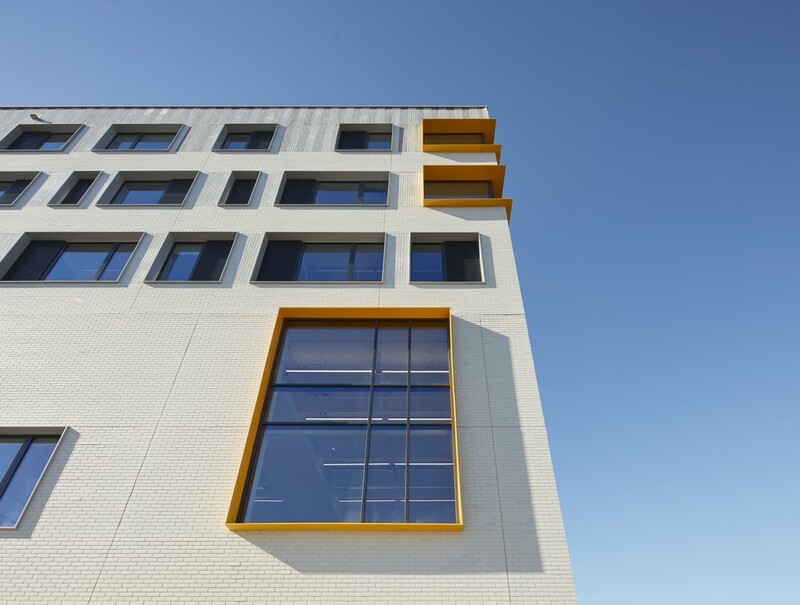 Penoyre & Prasad’s architecture is a direct response to the aims and ambitions of our clients and users. 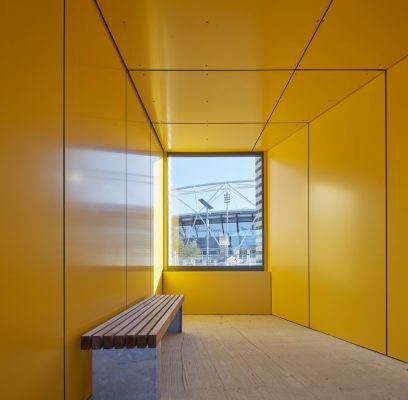 Sensitive to context, their designs can also be a catalyst for change, helping clients to achieve their organisational goals and adding significant value to their operations.